Our guests can expect free breakfast free Wi-Fi and an outdoor pool at the Quality Inn Vicksburg. The two-story hotel has 60 rooms accessed by exterior corridors. Rooms feature flat-panel cable TVs microwaves mini-fridges coffeemakers and complimentary Wi-Fi. Guests start their day with a free continental breakfast and then make use of the outdoor pool and fitness room. The hotel also provides a 24-hour front desk and barbeque facilities. Pets are permitted for an additional fee parking is free. 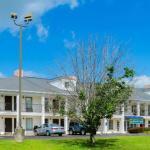 Located on I-20 the Quality Inn is a mile from Vicksburg National Military Park and approximately three miles from the historic downtown Vicksburg area George Washington Ball House and the Old Courthouse Museum. Shoppers head to Vicksburg Factory Outlet a seven-minute walk and museum buffs enjoy the Southern Cultural Heritage Complex and Biedenharn Coca-Cola Museum two miles away. Riverwalk Casino Ameristar Casino and Harrah's are among the casinos located on the Mississippi River within a 10-minute drive. It's 50 miles to Jackson-Evers International Airport.